Mrs. Paola Parra Harris is proud to be Cuban born and Florida raised. After arriving in the United States from Havana, Cuba at the tender age of 45 days old with her mother, grandmother, and 2 aunts, she grew up in a matriarchy in Miami, Florida. Her father, a physician, was not permitted to leave Cuba and later died there. She attended public schools in Dade County and received her Associate of Arts in English Literature from Miami Dade Community College, then earned her Bachelor of Arts degree from the University of Florida in 1992 in English Literature with a minor in Secondary Education. She earned her Juris Doctor degree from Mercer University, Walter F. George School of Law in Macon, Georgia in 1996. She is licensed to practice law in Florida and Georgia. Mrs. Parra Harris is fully bilingual and a large percentage of her clientele are Spanish speaking only. She has been practicing family trial law since 1998 after practicing insurance defense litigation in Atlanta, Georgia since 1996 and later in Jacksonville. Once in Jacksonville, Mrs. Parra Harris helped to form the Hispanic Bar Association of Northeast Florida and served as Founding President. Her demonstrated leadership, energy and enthusiasm to motivate others has gained her election as President of the Jacksonville Women Lawyers’ Association (JWLA), President of the Rotary Club of San Jose, Treasurer of the Florida Association of Women Lawyers (FAWL) and Chairman of the Board of Directors of Catholic Charities of Jacksonville. She currently serves on the Board of Directors of the Sulzbacher Center whose mission is to empower homeless and at risk women and children and men through health, housing and income services. She has been recognized as an Up & Comer by The Business Journal and was invited to join the Leadership Jacksonville Class of 2003. In June 2012, she was awarded the “Woman Lawyer of the Year” from her peers at the Jacksonville Women Lawyers Association (JWLA). She was recognized as 2011 Influential Hispanics on the First Coast by Eco Latino magazine. In January of 2019, she was recognized as an Ultimate Attorney in the area of Family Law by the Jacksonville Business Journal. As Chair of the Mayor’s Hispanic American Advisory Board, she successfully established and published the city’s first Bilingual Hispanic Directory of Resources (“La Guia”). She is active in many professional and civic organizations in Jacksonville. Jacksonville Mayors Delaney, Peyton, and Brown each have appointed her to various city advisory boards, transition team and the Port Task Force. She has a family of her own and takes seriously the concerns of her clients and is a zealous advocate for each and every client. 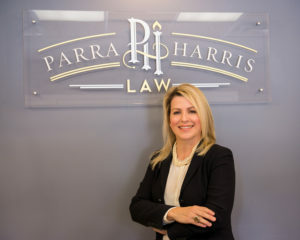 She takes tremendous pride in the law firm she founded in 2016, Parra Harris Law, and that her law practice concentrates in all areas affecting family disputes and of her success in achieving positive results for her family law clients.